I know it’s hard to imagine, but not everything I make is a triumph. I slip into a deep spiral when I spend hours trying some new recipe only to find that it’s really not that good. 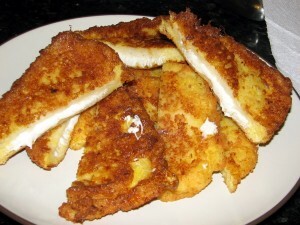 These fried mozzarella sandwiches, the only thing from the January ’09 Gourmet that wasn’t a runaway hit, were just odd. I followed all the directions, they came out looking just like the picture. But they didn’t have a whole lot of flavor, and they weren’t exciting enough to justify the calories involved. Most of this batch ended up uneaten. It was like savory french toast, filled with mozzarella and fried. I know it sounds like it should be heaven on a plate, but they were just not that thrilling. I did, however, come up with a pretty great tomato soup recipe to go with them. I’ll post that another day, but now here’s the sandwich recipe. Maybe others will have better luck than I did. 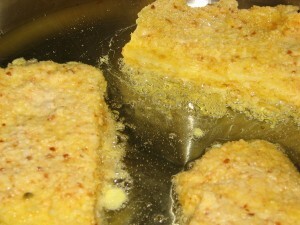 Melt butter in a small heavy saucepan over low heat. 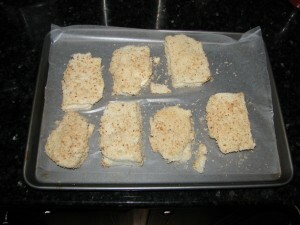 Discard any foam from top, then remove from heat. Stir in anchovies, capers, and lemon juice. Keep warm, covered. Stir in parsley just before serving. 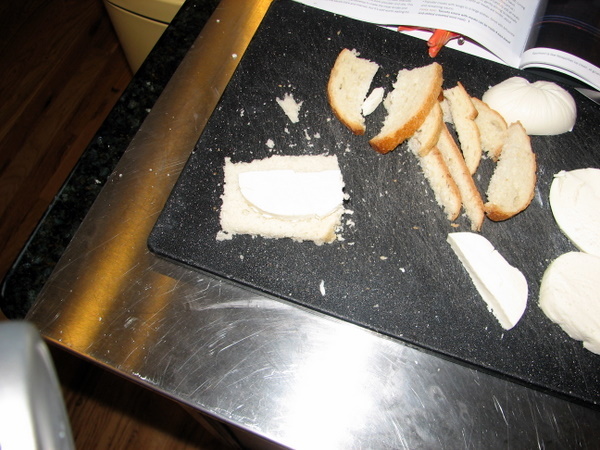 Cut bread from middle of loaf into 12 (1/4-inch-thick) slices. Sandwich each slice of mozzarella between 2 slices bread, then cut off crusts, forming 4-inch squares (mozzarella slices should be smaller than bread slices). Put 1 cup milk in a shallow dish and spread bread crumbs on a plate. 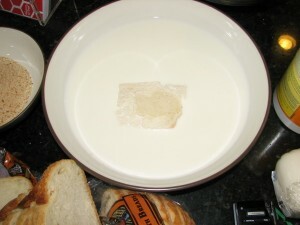 Dip both sides of each sandwich in milk, pressing edges lightly to seal sandwich. 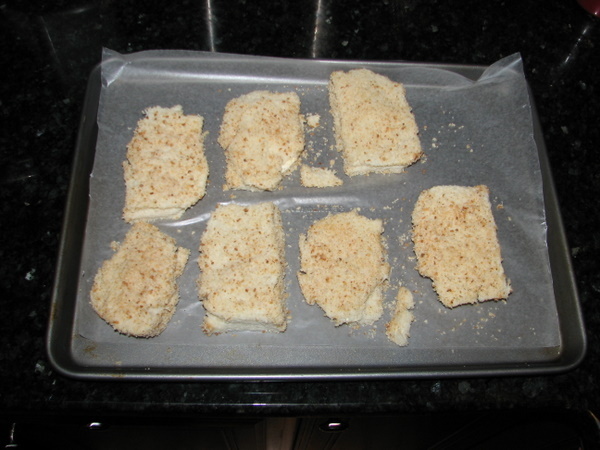 Coat with bread crumbs, making sure edges are coated well. Place on a parchment-lined baking sheet and chill 2 hours. Whisk eggs in a large shallow bowl, then whisk in 3/4 tsp salt and remaining 3 Tbsp milk. Heat 1/2 inch oil in a 12-inch skillet over medium heat until it shimmers. 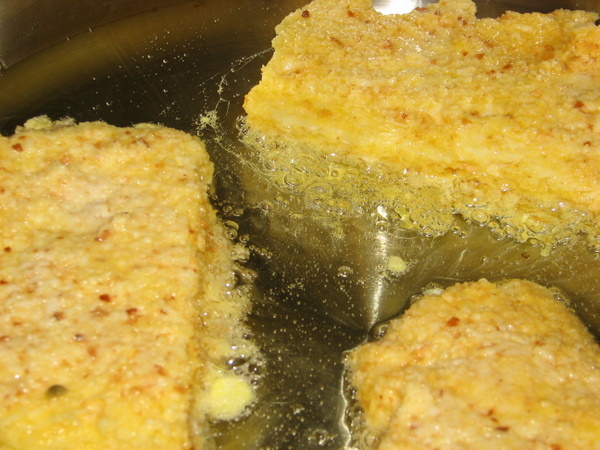 Dip sandwiches, 1 at a time, in egg mixture, letting excess drip off, and fry, 3 at a time, turning once with a slotted spatula, until golden, about 6 minutes per batch. Drain on paper towels. Halve diagonally and serve hot with anchovy sauce (I put it on the side).